Classic Midsomer Murders. Ties! Who wears ties these days? 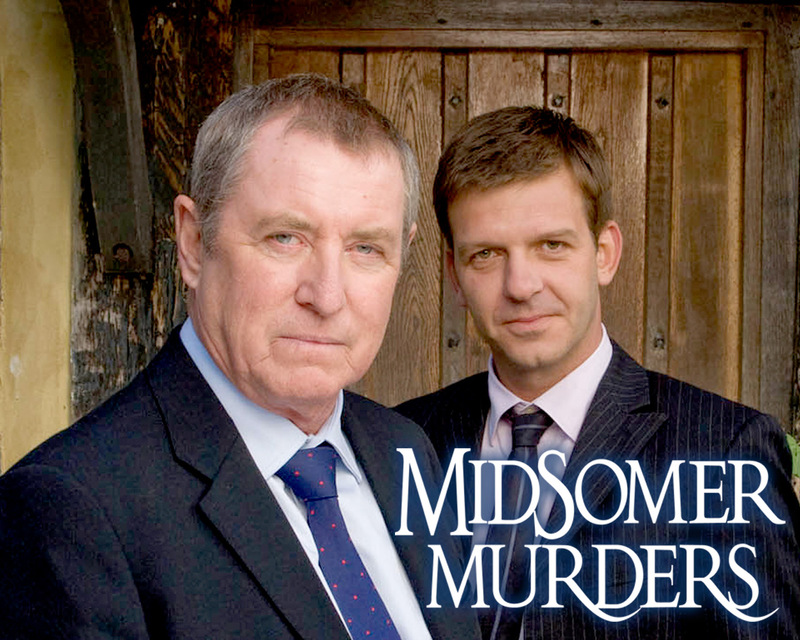 I’m not sure I’m keen for it to be widely known, but I am a fan of Midsomer Murders. I sometimes wish I could find it within me to be a fan of something cooler, grittier, edgier. Like The Wire. How I wish I could love The Wire. Or some subtitled Scandi-noir. But alas, like (surprisingly) Angela Merkel, (apparently) the whole population of Denmark, and (allegedly) the Queen herself,which seems apt somehow, I am a rather bemused addict. Perhaps Her Maj loathes the snooty upper classes as much as the rest of us do, because in all my compulsive watching of the show, this is the basis of my theory about its charm. The team behind it claim that the key to its huge success is to do with the incongruity between the idyllic scenery on the one hand- early Norman church succeeds charming rustic pub succeeds stunning country houses – and the mayhem that lurks there: the church probably has a murderous vicar, the charming rustic pub a sinister secret, and the poshies who inhabit the stunning country houses are invariably emotionally disturbed, if not actively depraved, and occasionally deranged. This isn’t wholly untrue – the charm of the countryside does make me think nostalgically of weekends away buried under the myriad doilies of the industrial strength chintz in a traditional rural English B&B and the famous, inevitable, fried breakfast. And the violence is really quite surprising – it is amazing that there is anyone left there at all. The local travel agents probably suggest a nice relaxing break in Basra as being safer. They don’t ruffle your feathers much with the murders though. You don’t feel anything at all, as a rule, and not just because I don’t think I’ve ever watched Midsomer without a glass of wine in my hand, but because they don’t want you to feel anything. I’ve only seen one or two episodes where the programme attempts to make you feel empathy for the victim, and they were sadly jarring experiences. Nothing must be allowed to disturb the coziness and somehow you accept the continual bloodshed- three murders per episode as a rule, in which the first murder causes the subsequent ones with a clockwork precision, clearly visible in hindsight when Detective Chief Inspector Barnaby lays it all out for our amazed, amused, information. I am completely fascinated by Midsomer. For a start, it is a very technically accomplished thing indeed, managing to hold a surprisingly large part of the world’s interest episode after episode. But I think think there is more to it than that – something mythic. Anything that successful, and it really is extraordinary quite how successful it is, must speak to something very deep in our psyches – and, given how worldwide its success is, not just those of us in the commonwealth. I think part of the core of its appeal is to do with class. The malefactors are (almost) invariably the upper classes. The husband might do something unexplained “in the City“, leaving their wife, either long suffering or adulterous, with little to do but some light gardening, or else they have inherited their money, but in any event, at least one of them is always vile. They are going to answer for their general nastiness, and it is not without satisfaction that we see them brained with a candelabra, or, in one memorable episode, pinned down with croquet hoops while wine bottles are launched at them from a replica roman catapult. It is exactly as we had always suspected: the upper orders really are vile. They may have the big house, a flash car, and possibly ancestors who they can trace back to the Norman conquest, but they really are not happy, and definitely are not nice people. Unlike the Barnabys. They are definitely our sort of people, with their university degrees and their responsible middle class jobs, and their general air of limitless professional competence. They are us, and they bring sober, sensible, practical solutions to the depraved world of crimes of passion and greed which stalk the green and pleasant land of Midsomer. Midsomer is the revenge of the Middle Classes. That’s why I have entitled this “the Discreet Charm of Midsomer Murders.” Like Bunuel’s Discreet Charm of the Bourgeoisie it reveals the middle classes to ourselves. Only, where Bunuel wanted to expose its soulless pretentiousness, the sort of attitude which gets marked down as bourgeois in the sense of dull, provincial, unadventurous, the world of Midsomer reflects us back to ourselves in much more flattering tones. The sober, sensible world of Barnaby, our middle class representative in this mayhem, demonstrates the worth of our carefully thought through attitude to life. Barnaby, you feel, is the sort of person who has a sensible pension plan set up and would be scrupulous in the matter of petty cash and committee minutes. He displays the sort of professionalism which we would like to display ourselves. While I have never been called to the scene of a gruesome murder, I like to think of myself as sometimes bringing order out of chaos, professionally speaking. And so Barnaby, the Barnabys even, are a sort of mythic hero for our culture, in a time in which it feels itself under threat, even though Barnaby himself would (probably) eschew any such extravagances. So let us raise a glass of (quite decent) red to him, and salute him in his endless quest to bring peace to the mythic realm of Midsomer, and the way in which he expresses the enduring value of our bourgeois attitudes of hard work, preparation, solid professionalism in any circumstance, with a bit more than a hint of bone dry humour to leaven the mix.